Besides the two Facebook-enabled mid-range Android smartphones and a slew of high-end Android devices, HTC has also launched a powerful aluminum tablet called HTC Flyer. The device should really be flying with a 1.5 GHz CPU (single-core), 1 GB of RAM and 32 GB of storage space (further expandable with microSD memory cards). It also features a 1024 x 600 7-inch screen, a 5-megapixel camera on the back and an additional 1.3-megapixel one on the front for video calls. It’s a powerful machine, but it does lack one thing its competitors have: Android Honeycomb. The HTC Flyer will be running an improved version of Android Gingerbread and a special version of HTC’s Sense UI designed for tablets. Furthermore, with a 7-inch screen, it’s smaller than most of its new competitors, such as the Motorola Xoom and the Samsung Galaxy Tab 10.1. 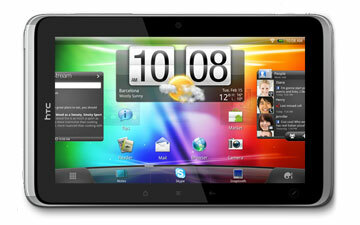 HTC will probably have to follow up on the Flyer soon if it wants to catch a sizable chunk of the tablet market.